At Elfrida we are passionate about teaching a curriculum that is relevant to the children in our school. We believe that every child has the fundamental right to an excellent education and that it our duty to provide this in the most stimulating way that we can. We believe that education should be broad, rich and deep and that children should be given plenty of opportunities to learn in different ways both in school and in the wider environment. 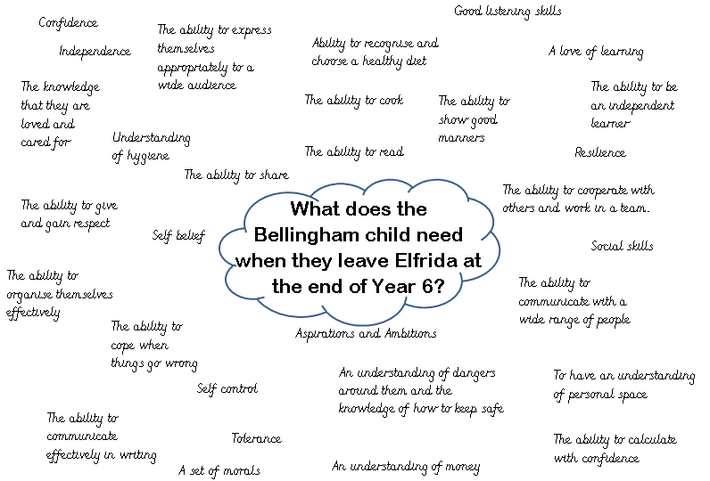 What is important to children growing up on the Bellingham estate? What resources can we use that will stimulate learning, that can be found locally? What knowledge and skills will equip them to become successful adults both socially and economically? How can we ensure that they aspire to great things in their future? How can we create life-long learners? We believe that children need to leave us with a set of skills, many of which are transferable throughout the different areas of the curriculum. We have developed a skills based focus for our curriculum, so that across all of the subjects everyone is aware of the progression of skills that the children need. This enables teachers to teach children at the right level, effectively supporting children who may be working below the expected standard for their age, as well as providing sufficient challenge for those pupils who are working at a greater depth. The skills relate to the National curriculum and the EYFS framework and are designed to ensure that across each year group, and Key Stage the children are all receiving the statutory education prescribed by the government. The skills in our curriculum are taught through a set of topics. Teachers and children have ownership of these topics and they are designed to be engaging for the children in the class at that time. In this way topics are flexible and children and teachers shape the learning as they go. Teachers track the skills that are taught across the year to ensure that everything is covered. Senior staff track the different topics and experiences the children are having to ensure there is no overlap or repetition and that the children are being offered a wide range of opportunities. The curriculum is regularly evaluated by staff and children to ensure that what we are teaching remains relevant and interesting to the children it is written for and to ensure that we continually offer quality learning experiences. To find out more details about our school curriculum please make an appointment to speak with Miss Cartwright, our Deputy Head. We would love to hear your feedback about the curriculum that your children are receiving at school. Please let us know your thoughts by filling in the form below. All comments are anonymous unless you include your name. Class pages contain regular up dates as to what the children are covering and also contain a copy of the class curriculum letter that is sent out at the start of every term, describing the topics and the learning in more detail. To access class pages click here. Elf Day - an annual day of creativity and fun! A creative approach to science - CSI style!